Jacob's Crackers: Persian Aubergine ....Nothing compares to Comfort Food, " Inexpensive & Low Calorie "
Everyone instinctively knows exactly what Comfort Food means, For me, it must be something fairly simple to make, satisfyingly tasty, maybe even wickedly indulgent . This Persian Aubergine dish is a take on the Vegetarian dish Imam Bayildi. It is warm, full of flavour & a substantial dish from the Eastern edge of the Mediterranean sea, where Europe meets Asia, not forgetting the influence of the Arab neighbours. These factors, all combined to give us a dish that offers the satisfaction which we all crave at some time, when we yearn for food that fills us with contentment. It cost nothing and taste like a million dollars. With "Value " in mind, I have sourced all ingredients from LIDL, and here is a Meal for Two,(or even four, depending how hungry you are !! ) all under €5.00 and under 300 calories per halves. 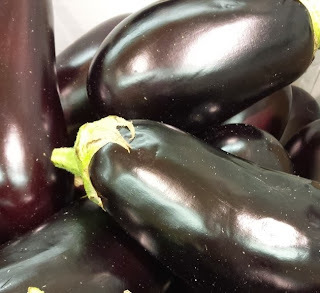 Aubergine also known as Eggplant or Brinjal, a long slender variety, found in Southern & Eastern Asia. This glossy deep purple vegetable has white flesh with a meaty texture. It is also low in fat, protein & carbohydrates. Aubergine is one of the most popular vegetable in the Middle east and has come to epitomise this Cuisine, whether grilled in it's skin and the flesh mashed up into a Baba ghanoush, grilled into Kebabs, layered into a Moussaka or casseroled into a Ratatouille, But the most famous Aubergine dish must be Imam Bayildi. A succulent and truly scrumptious Vegetarian dish, where this vegetable is stuffed with onions, garlic & tomatoes. Imam Bayildi is a truly celebrated dish in Turkey. Here, I have added beef, to make it more substantial and have everyday eating at it's best . Cut the Aubergines in half, length ways. Scoop out the flesh, leaving a shell to hold the stuffing. Roughly chop the scooped out flesh. Heat the oil in a heavy based pan, fry the beef until brown. Add the onions and continue to cook until softened. Add the garlic & spices, stirring until fragrant.Add some of the reserved tomato juice, if sticking to prevent the mix from burning . Stir in the chopped up aubergine flesh,and the tomatoes, breaking them up with a fork . Season to taste with salt and fresh ground black pepper , mint,thyme and simmer until the mixture has reduced and thickened slightly . Finally stir in the chopped parsley. 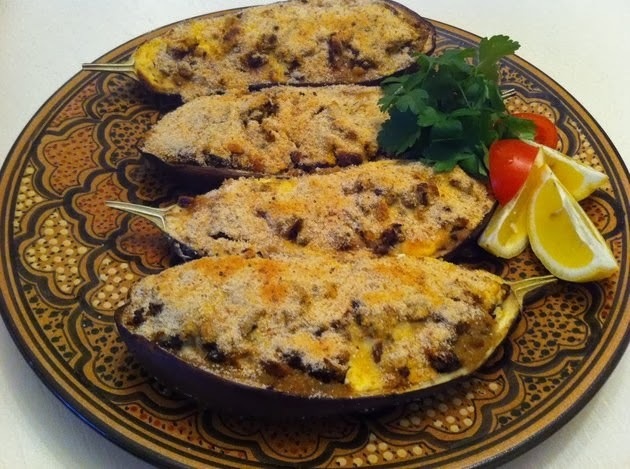 Spoon the stuffing back into the aubergine shells , place side by side in a shallow oven proof dish, Squeeze over some lemon juice and sprinkle all over with some couscous or fine bread crumbs. Bake in the hot oven for 30-40 mins until tender and golden. Use mince lamb or mince turkey . Use Courgettes , Peppers , Beef tomatoes or even large Spanish onions . and drizzle over a béchamel sauce ( optional ), grated Mozzarella or Feta Cheese . Serve with crusty bread and a side salad . Nothing Compares to Comfort Food . " Afiyet Olsun "